Have you ever felt uncomfortable sharing your faith? Do you feel like you can’t communicate your answers to those who ask? Do you ever ask yourself “Why do I believe this” ? If you answered “yes” to any of these questions, you should check out the new Oasis study starting this semester on September 8th. “Why Do You Believe That?” is a video based series that focuses on apologetics and answering the many questions that people may have about Christianity. 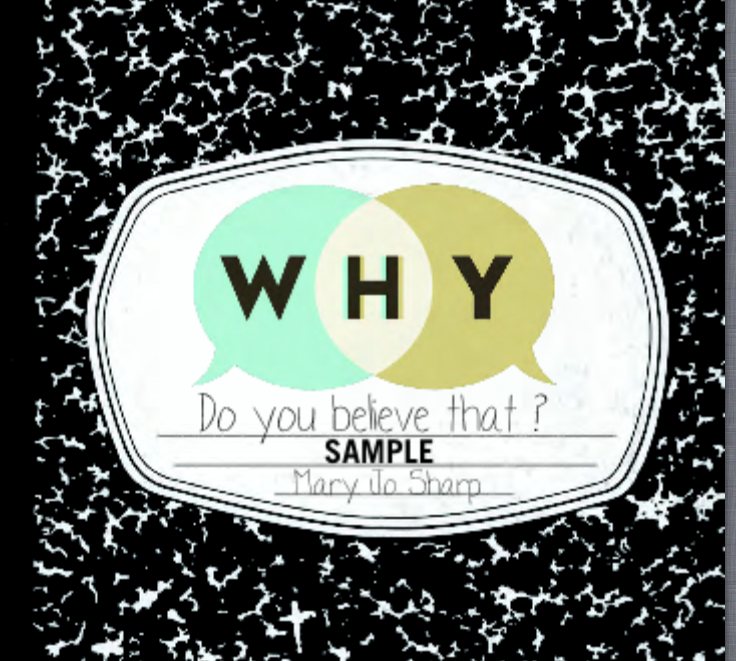 Mary Jo Sharp was once an atheist, but the Lord opened her eyes and now she is passionate about giving women the confidence and answers they need to share their faith with others. This semester we have the awesome opportunity of having a wonderful live speaker…and she has a familiar face. That’s right!! Our very own Erica Wiggenhorn will be back with us, and she will be sharing her brand new study: Moses: Every Life Proof of God’s Promises. We got to ask her a few questions about the study, and we wanted to give you the chance to hear her heart before the semester gets under way. Question: What inspired you to write this study/why Moses? Answer: Unlike Ezekiel, which God continually prompted me to open and read for a reason totally unbeknownst to me, Moses came from a personal search. One of our children began exhibiting some heart attitudes and behaviors that were concerning to Jonathan & I. Because our children are adopted, I went to Scripture’s first mention of adoption, which is Moses, begging God to give me insight into the hearts and minds of my children. While I always thought the story of Moses was about a great and powerful leader that God used to accomplish glorious tasks, what God showed me during my time with Him in this portion of Scripture is that there is a back story to Moses that is more amazing and breathtaking than the parting of the Red Sea or the arrival to the Promised Land…A love story that needed to be told. God began to reveal to me that Moses was actually not a fearless leader as I had always assumed. Rather, he was a flawed man, gripped and paralyzed by fear. He was a broken man, marred by lack of identity, broken relationships, fear of abandonment, trapped in the shame of past failure, and void of purpose. The incredible thing about Moses’ life is not so much the incredible ways he was used by God as it is about the amazing way in which he experienced friendship with God. Over and over again, God invited Moses to be His friend; to bring Him his hurt and his struggles and allow God to bring healing and perspective that Moses would never gain without God’s tender touch. Question: What would you like to see the women of DSCC take away from this study? Answer: God offers that same relationship to us. He longs to show us what it means to have our identity in Him, bring restoration to our relationships, remove the shackles of fear and insecurity that trap us from moving forward in our faith journey, and fill our lives with great purpose. He longs to offer His healing touch and His friendship. The question is: will we come? Will we bring Him all of that brokenness and allow Him to transform it into something radiant? Moses: Every Life Proof of God’s Promises is a challenge to step out in faith and come. Come and receive the promises that God has for us and live a life transformed by His healing power. We hope that you will be praying about joining us for Women’s Bible Study this semester starting September 10th, 2013. Be checking SOON on the website, Facebook, and Twitter for the link to register. As the doctor perched himself on the edge of the counter his words ripped through my soul, piercing more sharply than the icy chill of winter. Your chances are one in a million. Clearly uncomfortable at delivering such staggering news, he nervously glanced at his watch and mumbled something about having to leave, uttered a feeble good-bye and hastily exited the exam room. One in a million. The words echoed through my mind and bounced off of the walls of that sterile hospital setting mocking me and my foolish hopes that modern medicine would grant me the answer for which I so desperately searched. I wanted a baby. More than anything. It had been our quest to grow our family for over three years. Pills, appointments, pricks, procedures, prodding, probing and now it was over. The verdict was final. Our odds were one in a million of it ever happening. As my mind swirled and my emotions reeled, I began to ask that ever present question in moments of confusion, “Why? Why me? Why this?”. My thoughts began to grow darker and darker, my heart grew heavier and sank like a stone within my chest. I moved on to the more difficult questions, “Now what? How will I ever move past this?”. The days and months that followed were even more difficult than the previous three years had been. Everywhere I turned there were babies. Smiling, doting mothers carrying babies in their arms. Nervous, expectant mothers carrying babies in their bellies. Babies carrying babies who seemed so unprepared to enter into the realm of motherhood, but my arms remained empty. Each week it seemed someone in our Sunday school class announced their wonderful news that they were expecting. It became so painful, we pulled away from the class and quit attending. The breaking point finally came one summer day when a friend of mine called me asking if I could meet her for coffee. She wanted to talk. I knew I had hurt her by my abrupt pulling away in our friendship. I hated myself for it, but could barely muster enough emotional energy to get out of bed in the morning, let alone invest in a friendship. I spent days asking God to just take me home so I could escape the emotional pain of my shattered dreams of motherhood. I drove into the parking lot prepared to apologize and come clean with the news we had been delivered. I had been so reluctant to share with my friends because so many of them were also trying to start their families, or grow their families, and I didn’t want our devastating news to put a damper on their joy. I felt shame and guilt over not being able to rejoice in the miracle of life that God had chosen to give them and not me. Instead I felt bitter and my inability to truly rejoice for them led to self-loathing that caused me to spiral down emotionally into an even deeper hole. There seemed no way out. I was in such deep despair that there appeared but only a pinhole of sunlight at the top of my pit. As I walked into the Barnes and Noble Cafe my friend was beaming. She was literally radiant and she couldn’t stop smiling even when she took a sip of her coffee. She wanted to tell me the good news in person: she was pregnant. I begged God to give me the grace to rejoice in this moment with her. I knew her journey had been equally as long as mine and she had doubted many times if it would ever happen for her. I wanted more than anything to be happy for her. I hugged her tightly and tears streamed down both of our faces. Hers with joy, mine with agony. I cupped her face in my hands and said with every last ounce of strength I had, “I am so happy for you! You will be a wonderful mother!”. Always a bundle of energy, she had to run, leaving me sitting in a heap in the cafe chair. When she was out of sight, I stood up, and methodically plodded back to my car, aimless in purpose or destination. I slid into the drivers’ seat and started the engine. I began to sob. My body began to shake. I began to writhe and the sobs became so forceful they wracked my body back and forth until I could no longer move. I hated myself. I hated the self pity that enveloped my world causing me to shut everyone and everything else out. My prayer changed at that moment. Rather than asking God to save me from my circumstances, I asked Him to save me from myself. Instantly I felt the peace and presence of God wash over me. Truly God kept His promise when He says that He is close to the brokenhearted and saves those who are crushed in spirit. Jesus became so real to me in that moment it was almost as if through my tear stained face I could see Him sitting next to me in my car. I felt the calming protective sense of His touch. He whispered in my spirit, not audibly, but most clearly. “Behold, I am doing a new thing, do you not perceive it? I shall surely make you a mother. And when it comes to pass it will happen in such a way that you know that I, the LORD, have done it. I am the LORD, the LORD alone, and I will not share my glory with another”. I would have doubted the truth of it, chalking it up to emotional exhaustion and grief, but it was so clear and resulted in such an immediate lifting of my spirit, that I knew in that moment, the LORD had spoken to me. It is not an occurrence that happened often in my life, and I knew that to disbelieve Him would mean the rest of my life would move towards a weak and timid faith. This was the breaking point. Would I believe His plan for me even when every circumstance proved otherwise? Would I stay in my selfish, sin sick state, or be bold enough to step out in faith and believe Him? I drove home that day a different person. Were there still dark days? Yes. Did I experience moments of doubt? Of course. Did I miraculously get pregnant defying the one in a million odds? No. Did God fulfill His promise He gave to me that day? Absolutely! But that’s another story for another day.